Eye Love Wednesday - eye make-up removers from Lise Watier, Annabelle and Klorane! Lise Watier Solution Double Dual Phase Eye Makeup Remover -120ml - $24 - gently and quickly removes all traces of makeup (even waterproof formulations) from your eyelids and lashes. The oil phase dissolves eye makeup and mascara. The water phase soothes the eye area's delicate skin. Available at drugstores across Canada and online at www.lisewatier.com. 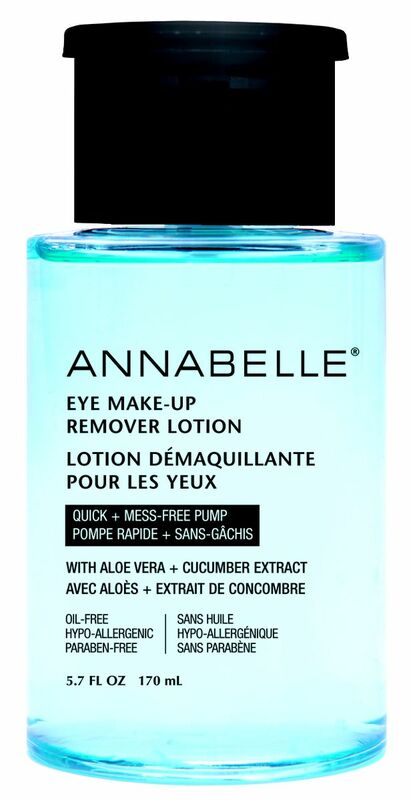 Annabelle Eye Make-Up Remover Lotion - 170ml - $9.95 - the aloe vera and cucumber extract infused formula gently removes all traces of eye makeup including long lasting and waterproof formulas while soothing the skin, leaving it toned and revitalized. The best part is the pump, which makes it easy to use, quick and mess free. The formula is also ophthalmologist tested, hypo-allergenic, perfume, oil, alcohol, soap and paraben free. Available at drugstores and online at annabelle.ca. Klorane Floral Lotion Eye Make-Up Remover - 200ml - $17.25 - easily removes makeup and contains soothing cornflower making it ideal for even the most sensitive eyes and contact lens wearers. Leaves skin fresh, soothed, decongested and can even be used as an eye compass for an enhanced soothing and relaxing effect - just saturate a couple of cotton pads, place over your eyes and sit back and relax for 5 minutes! Available at Jean Coutu, London Drugs and Rexall drugstores across Canada.